You can Normal Summon this card without Tributing. If you do, during the End Phase: Send it to the Graveyard, then take damage equal to its ATK in the Graveyard. This card must be the only Zombie-Type monster on the field to activate and to resolve this effect. 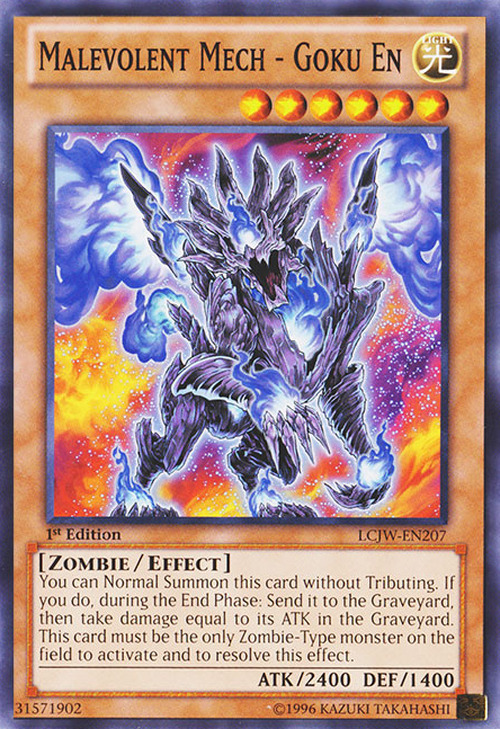 This is a Zombie version of Majestic Mech - Ohka, whose Japanese name translates to Lightning Gear - Cherry Fire as opposed to this card, Darkness Gear - Imprisoning Flames. Ironically, this card's Attribute is LIGHT, even though its Japanese name is Darkness Gear - Imprisoning Flames. 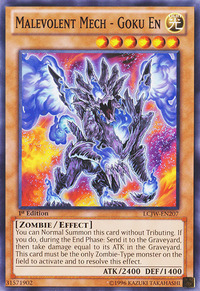 This card is the second of three Zombie-type monsters with a LIGHT Attribute, the other two being Spirit of the Pharaoh and Paladin of the Cursed Dragon. This monster is very similar to Zombie Mammoth. Both monsters are Zombie-Types, both cards have an ability that sends them from the field to the Graveyard if there are no Zombie-Type monsters in certain locations (this card must not be the only Zombie on the field at the End Phase and with Mammoth, there must be at least one Zombie in the Graveyard or it's destroyed immediately) and when sent to the Graveyard, you take damage equal to their ATK points (albeit this card inflicts damage equal to its original ATK). The damage is equal to the original ATK of "Malevolent Mech - Goku En", not its current ATK. : When the ATK of "Malevolent Mech - Goku En" has changed, does the damage change?